Home » Health » What Is Gallstones? Gallstones are small rocks derived from cholesterol, and are formed in the human bile ducts. In most cases, this gallstone will not cause any symptoms. However, sometimes this rock will clog the end of the bile so it will trigger a sudden pain that is quite great. This pain is called colic pain, and can last for hours. The size of gallstones vary. There are as small as grains of sand and there are as big as a ping pong ball. The number of stones formed in the gallbladder also varies, for example there are people who have only one stone and there are more. Gallstones allegedly formed due to hardening of cholesterol accumulated in bile. This occurs because of an imbalance between the amount of cholesterol and the chemical compounds in the liquid. Age factor . The risk of kidney stone disease will increase with age. This disease is generally experienced by people aged over 40 years. Gender. Women's risk for getting gallstones is higher than men. The impact of childbirth. Women who have given birth have a higher risk. The cause may be due to rising cholesterol levels due to changes in estrogen hormone during pregnancy. The influence of weight. Your risk will increase if you are overweight, obese , and drastic weight loss. The presence of gallstones often will not cause symptoms, so it does not require special handling. But if it causes disturbing symptoms or if complications occur, the disease should be treated. Gallstones can be treated with drugs until surgical removal of the gallbladder. Although the function of these organs is important, our bodies can survive without having them. Without a gallbladder, the liver will continue to secrete bile which helps in the digestion of fat. The type of surgery that is commonly recommended is a 'key hole' operation or a medical term for laparoscopic cholecystectomy. This type of surgery is recommended because of its simple method with a low risk of complications. Persistent pain in the stomach. Acute pancreatitis is also a dangerous risk if gallstones enter and inhibit the pancreatic ducts. Inflammation of the pancreas will cause stomach pain that will continue to grow worse. Gallstones generally do not cause disease. Symptoms can occur if the stone blocks the gallbladder or other gastrointestinal tract. The main symptom that is usually experienced is abdominal pain that comes suddenly or called with biliary colic. It can last for a few minutes to hours. It will not decrease even if it has been to the toilet, fart, or vomit. The frequency of occurrence is rare but can be triggered by foods with high levels of fat. Persistent or constant back pain. It is important for you to be wary of biliary colic even though the symptoms are trivial and inconsistent. Immediately consult your doctor if you have severe stomachache lasting more than eight hours, jaundice or fever. The emergence of gallstones is thought to be due to an imbalance between cholesterol and chemical compounds in bile. The shaped crystals that form will develop into stones and usually within years. The accumulation of chemical compounds commonly present in the gallbladder when the rock is formed is cholesterol and bilirubin (waste from destruction of red blood cells). Nearly 80 percent of gallstones are cholesterol-based and about 20 percent are bilirubin-based. Bilirubin is a pigment found in bile. 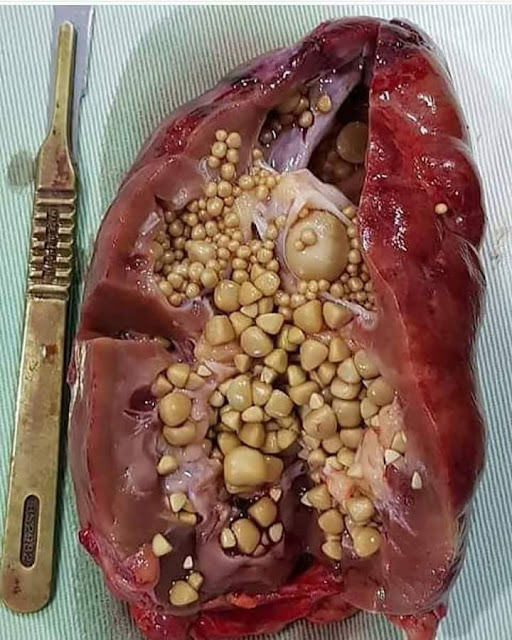 The size of gallstone that is formed also vary. There are as small as a grain of sand and there is as big as a ping pong ball. So is the amount. There are people who have only one stone and there are more. The likelihood of the appearance of gallstones is different for each person. Specifically, women are at twice the risk of men. Especially women who have been pregnant, taking birth control pills, or undergoing high-dose hormone therapy. In addition, the incidence of gallstones will increase in those with sickle cell anemia . In patients with crescent moon cell anemia, red blood cells will be broken down continuously by the body, and eventually converted into bilirubin. This buildup of bilirubin levels can cause gallstones. A British research data shows that more than half of people with crescent anemia will have complications of gallstones. Have a family member with the same disease. Often consume fatty foods or high cholesterol . Patients with digestive disorders, such as Crohn's disease and irritable bowel syndrome. People who use ceftriaxone , an antibiotic that can be used to treat pneumonia, meningitis, and gonorrhea. People who lose weight drastically. If you feel the symptoms that indicate the occurrence of complications, you should immediately see a doctor. As a first step, you will undergo a physical exam. The gallbladder is in the upper right part of the abdomen. The patient will be asked to inhale, then the doctor will press the upper right part of the abdomen. If you feel pain, there may be inflammation in the gallbladder. If proven to be so, further tests will be recommended to ensure the severity of the inflammatory severity. Blood tests can be done to check whether an infection occurs or to examine the patient's liver function. Liver function will be disrupted if there is a gallstone that moves into the bile ducts. Doctors may also examine lipase and amylase enzymes if there are signs of pancreatitis. The levels of these two enzymes will generally triple in patients with acute pancreatitis. The type of ultrasound that you will undergo is the same as an ultrasound test to check for pregnancy. But the ultrasound will be directed to the upper abdomen. This detailed scanning process is performed to check for the presence of gallstones in the gastrointestinal tract. If the patient has severe abdominal pain, this type of scan can be used as an emergency check in the diagnosis process. CT scans are also used to check whether complications arise from gallstones, such as acute pancreatitis. However, this scanning method does not work as well with MRI scans. Cholangiography is performed to examine the presence of stones in the digestive tract including the bile ducts. The examination with cholangiography uses a kind of ink that is injected into the patient's bloodstream. With this ink, the digestive tract can be studied after an X-ray image is taken. If the bile ducts function properly, the absorbed ink will successfully flow into the liver, bile ducts, intestines, and gallbladder. The impact and development of gall stones vary by person. Therefore, some feel the symptoms and some are not. The treatment step will be adjusted to how much it affects you. Increased alertness and regular monitoring are often the main recommendations in addressing this condition. If gallstones do not cause any symptoms, doctors usually do not advocate medical intervention. But if you have other diseases that can heighten the possibility of complications, you will be advised to undergo treatment. The types of diseases that increase the risk of gallbladder complications are cirrhosis , diabetes , or portal hypertension (high blood pressure that occurs in the liver). If you have gallstones, as well as high calcium levels in the gallbladder, treatment steps will be recommended. This is because a combination of gallstones and high calcium can cause cancer of the gallbladder if left unchecked. If you have mild and rare abdominal pain, your doctor may recommend taking painkillers (analgesics) and a healthy diet to control your symptoms. If you experience severe and frequent stomach pain, your doctor will usually advocate the procedure for removal of the gallbladder. Its low level of effectiveness. The patient should take it for a long time (sometimes more than a year). Gallstones can reappear if consumption is stopped. Ursodeoxycholic acid is also not recommended for pregnant or lactating women. This drug can also affect the effectiveness of birth control pills. Therefore, women using birth control pills are encouraged to replace them with safety equipment such as condoms if taking this drug. In addition to treatment, ursodeoxycholic acid is also recommended to prevent the formation of gallstones for those at high risk. If your symptoms are severe, your gallbladder may have to be removed by surgery. But you need not be afraid because the gallbladder does not include the vital organs you must have to survive. The most commonly recommended gallbladder removal surgery is a 'keyhole' or laparoscopic cholecystectomy. In this operation, the doctor will make one incision 2-3 cm in size around the navel, and two to three incisions with a smaller size on the right side of the stomach. This operation is done with total anesthesia, so you will fall asleep during the procedure so it will not hurt. The recovery period required by patients is usually about 1-2 weeks. The location of the patient's gallbladder is difficult to reach. Patients with high body weight. The patient is in the last months of pregnancy. After undergoing cholecystectomy with an open incision, the patient needs to stay in the hospital for 5-6 days. The time taken to heal the total is also longer than the 'keyhole' operation, which is about 1.5 months. But the level of effectiveness of this operation is similar to that of laparoscopic cholecystectomy. Blockage due to stones in the bile ducts can be treated with endoscopic retrograde cholangiopancreatography (ERCP) cholangiopancreatography procedures. This procedure aims to remove gallstones without lifting the gallbladder. This procedure is often performed on those whose condition is not strong enough to undergo surgical procedures. In addition to therapeutic procedures, ERCP can also function as a diagnostic enforcement, where a flexible thin tube with a camera at the end will be inserted from the mouth to the gallbladder. The condition of the liver, bile ducts, and pancreas will be clearly visible with this procedure. ERCP is usually performed with intravenous anesthesia, in which the patient will remain conscious during this procedure. The ERCP process takes about 30-60 minutes, or faster. After undergoing this procedure, patients generally have to stay one night in the hospital for condition monitoring. Changing your diet by eating only low-fat foods can not cure gallstones, but maintaining a healthy and balanced diet can help us to maintain health and reduce the pain caused by gall stones. Gallstones may cause blockage of the bile duct or move into the digestive system. This is what usually causes serious complications. Cholecystitis or acute gallbladder inflammation occurs when bile builds up in the gallbladder because there is a gallstone blocking the fluid outlet. Symptoms of acute cholecystitis include pain in the upper abdomen that radiates to the shoulder blades, high fever, and rapid heartbeat. Antibiotics are generally used as the first treatment to treat infections before surgical removal of the gallbladder is performed. The procedure used is usually a 'keyhole' operation. Pus may occasionally appear in the gallbladder due to severe infection. If this happens, treatment with antibiotics alone is not enough and the pus will need to be aspirated. Peritonitis is an inflammation of the inner lining of the stomach known as the peritoneum. This complication occurs due to rupture of the gallbladder that has severe inflammation. Treatment includes infusion of antibiotics, to surgery to remove the part of the peritoneum that suffered severe damage. Blockage of the bile duct by the stone makes this channel susceptible to infection-causing bacteria, or medically called acute cholangitis. These complications can generally be treated with antibiotics and endoscopic retrograde cholangiopancreatography (ERCP) procedures. Symptoms of this infection are upper abdominal pain that radiates to the shoulder blades, jaundice, high fever, fever, itching of the skin and confusion. Acute pancreatitis is also one of the complications that can occur if gallstones out and clog the pancreatic ducts. Inflammation of the pancreas will cause great pain in the middle of the stomach. This pain will get worse and spread to the back, especially after eating. In addition to abdominal pain, acute pancreatitis can also cause other symptoms. Among these are diarrhea, loss of appetite, nausea, vomiting, high fever, and jaundice. Hunched or curled position may help relieve abdominal pain due to acute pancreatitis. This complication can not be cured with special treatment. The goal of treatment is only to support the function of the body until the inflammation subsides on its own. Hospital care generally lasts about a week before patients are allowed home, such as intravenous fluids, oxygen therapy, painkillers, and dietary adjustments. Gallstones suffer a higher risk of developing gallbladder cancer. However, the likelihood of occurrence is very rare, even for people at high risk because of hereditary factors once. Surgical removal of the gallbladder will be advisable to prevent cancer, especially if you have high levels of calcium in the gallbladder. Symptoms of this cancer is almost the same as gallstone disease that includes abdominal pain, high fever, and jaundice. Treatments such as chemotherapy and radiotherapy can also be performed if a person has gallbladder cancer. Changing your diet and losing weight for those who are obese can help prevent the formation of gallstones. Oily food like fried food. Food made from nuts such as peanut sauce or satay seasoning. Too much alcohol consumption can also heighten your risk, so it's best not to overdo it. In general, the recommended recommendation is no more than 2 units of alcohol per day. These two units of alcohol are simply equal to about 1.5 cans of beer or 1.5 glasses of wine ( wine ). Keep in mind that each liquor has a different alcohol content, so the amount must be adjusted so as not to exceed the maximum limit per day. Being overweight or obese is one of the risk factors that can cause gallstones complications. Therefore, maintaining a healthy weight is very important. You are advised to avoid a strict diet that demands to eat low-calorie and fat foods alone. Drastic weight loss in a short time can also increase the risk of gallstones formation. 0 Response to "What Is Gallstones?"